1. Blogging adds fresh content to your website. 3. Blogging informs and educates. 4. Blogging makes your website stickier. 5. Blogging increases your search engine presence. 6. Blogging gives you something to share on social media. 7. Blogging helps you build relationships and trust with prospects. 8. Blogging builds your marketplace authority. I’m not going to get into all of the technical details of building a blog from scratch here. That’s a bit out of the scope of this post. But I will tell you generally how you should structure your blog for best results. The most important thing you need to know is your blog should be ON your website rather than OFF your website for best results. In other words, if your website is www.YourWebsite.com then your blog should be located at www.YourWebsite.com/blog for example. It’s also ok to call it something other than “blog” — for example www.YourWebsite.com/news is ok too. Again, the most important thing is that your blog is part of your main business website. This is critical for achieving the best SEO and Social Media and even Lead Conversion results. 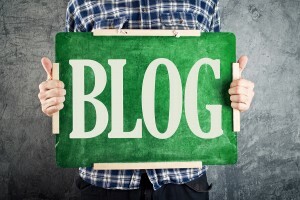 Should You Write The Blog Posts? Once you have a blog in place, it’s time to start pouring out the content. This is the point where you’ll need to ask yourself, “Who is going to write & publish the content?” If you’re a strong writer AND you have the time AND it’s worth it to you to do so, then you should be writing the content yourself. This is especially true for authors, speakers, and any type of business where YOUR IDEAS are a critical part of the business itself. This won’t be the case for most small businesses, though, so be careful you’re not just being controlling. Remember: as a business owner you likely have better things to do in your business rather than writing blog posts. The majority of small businesses will need to hire someone to handle the blog for them. You can either hire a freelancer or full service company to handle this for you. Freelancers can be great, but just realize that you’re relying on one person who might get sick, get flakey, or get sloppy. The very best option is to hire a blogging company that can handle everything for you — blog writing, blog posting, and blog marketing. We offer a service that does exactly that, and you can read all about it right here. What questions do you have about blogging for your small business? Leave your comment below. Lots of people dream about starting a small business, but there is nothing easy about starting your own business.Starting a business is not such a big deal. But managing the process for a long time is the primary challenge for every small business or startup.